Matter Design is a research-driven design firm founded by Brandon Clifford and Wes McGee in 2008. The founders are based in Boston and Ann Arbor where they practice and teach at MIT and the University of Michigan. With a focus on the intersection of drawing and making, the firm’s award-winning projects continually explore cutting-edge fabrication processes, materiality, and the integration of diverse environmental and structural systems. Last week, Modelo spent some time with Brandon Clifford to learn more about the firm’s background and aspirations for the future. It was early. When I was growing up I enjoyed analytical classes like math and science, but also enjoyed art, so the inclination was to go into architecture because it was somehow at that cross-section. Because of that, I went to Georgia Tech thinking that it would be very engineered-focused architecture, came to realize there’s no real basis for that. Architecture is Architecture. That’s how I got started. I’ve never really looked into another field. For awhile I wanted to be an industrial designer but we also do that here designing furniture and jewelry. I don’t see much difference though, design is design. Wes and I met at Georgia Tech. I was doing my undergraduate in Architecture and he had just finished a degree in mechanical engineering and was doing a masters in industrial design. At that point in time at Georgia Tech architects were mostly staying upstairs in the studio building small models, staying clean (laughs) The industrial designers were downstairs in the shop actually making things. Creating furniture, putting these incredible finishes on things. I really enjoyed being down there and that’s where I met Wes. Wes is full-time at Michigan in Ann Arbor and I’m full time here in Boston at MIT. That’s the thing about our practice. We are also both full time at Matter Design, though in our respective locations.The only time we’ve lived in the same city is the time when we weren’t serious about working together. When I moved to New York we did some projects together. Then when I went back to graduate school, that’s when we started the firm. So Matter Design has never been in the same city and it just works that way. A few minutes ago Wes and I were on Google Hangouts together. That’s how we communicate. We share files on Dropbox. That’s how it’s always been done. One of the most difficult things to overcome is not how we communicate with each other, but how we communicate with other collaborators. We have particular ways that we share files with each other and this is really true in any office, when you share with the consultant they don’t understand how to read the name or the date convention. When we share files we are very diligent on how we label layers in Rhino. They’re always synced with each other’s folders. There’s occasionally a moment where he’s going to use a file for fabrication purposes and comes back and says we really need it at this degree versus the one I created it in, but there’s never been a sense of frustration. But sharing files and collaborating with other external consultants somehow becomes a struggle. Intellectually it’s evolved quite a bit. We’re doing more and more projects, more frequently and entering competitions for larger scale projects. It’s not necessarily a focus of the practice to grow in scale but to grow in complexity of the work is something we’re dedicated to. The practice really began with one motivation: develop reciprocity between how things are drawn and how things are made. That was very straight-forward. How can we design something that’s capable of being fabricated? It only had to do with procedural methods and materials and translating things that are virtual into physical objects. But now we’re becoming more and more interested in integrating other things into our work like environmental systems, structural logic, physics, behaviors. As we do that the projects become much more complex and I would say much closer to architecture than the earlier work. In the end this motivation is not driven by scale or clients, but dedication to the discourse and discipline of architecture. Our focus on drawing and making is entirely based on the revolution that’s taking place right now in architecture and other industries with digital fabrication. We’re becoming capable of getting connected to how things are made in ways that haven’t happened since the 15 and 1600s. Stonemasons were the ones who became architects. It wasn’t the other way around. You didn’t go to school for a series of contemplative exercises and come out the other side and say “I know how to build buildings.” You grow up through the craft and trade of something, whether it be carpentry, stone masonry, or some other craft. They weren’t called architects, they were called master makers. Now historically as we look back at them we call them architects. During the Industrial era, essentially what we turned into is a profession that produces representations of architectural intent. So we draw things, we print them out and we ask contractors to go and make them. Because of this lag in time where we’ve only been making these drawings through orthographic projections we really lost an understanding of how things get assembled, the complexity of physical space. You also get a dived between contractors and architects. You hear about these feuds all the time where contractors say architects don’t know how to make things. At the same time architects say contractors don’t respect what they’re offering. What’s exciting right now with digital fabrication is that architects are becoming integrated in how things are made, again. This is why we are seeing the boom in architectural installations, or as I would prefer to call them speculative works that are built by the architects themselves. Architects are figuring out how to draw things that are directly connected to how things are made. I think the next boom that we’re going to see happen is where architects are going to start drawing things with intelligence behind them that have to do with other concerns and contingencies. Things like structures, environmental systems, lighting. So you see all these computation platforms building around those things and this is new, this is really new and we’re excited by it. As a base platform Rhino is great, especially with David Rutton’s Grasshopper (originally Explicit History). Then there are a series of other plugins. One that we use very regularly is Daniel Piker’s Kangaroo. We recently collaborated with Daniel. He’s brilliant and integrated the way that physics can deal with the procedural logic of fabrication. Wes has been writing a software platform that takes you directly from a 3D object in Rhino into a robotic operation. That platform is done in collaboration with Dave Pigram and is called Super Matter Tools. It’s bypassing these restrictions of saying here’s the 3D model, there’s the code over there, maybe even connected to the 3D model. Then at a certain moment we have to kill that. Save it. Put it in another platform and lose some information. We then create CAM software information and figure out how to output that into yet another platform that sends it to whatever dedicated machine is going to make it. If you take those series of freeze frame killing-the-process moments and synchronize them together you have Super Matter Tools. The collaboration with Daniel incorporates physics into that reciprocal process. There are some procedural effects that we’re using that have to do with synchronizing these different logics and we’re seeing some of that happen as we work with industry partners. For example we have a research project with Quarra Stone in Madison, Wisconsin. We find it to be a fruitful endeavor. When we began as a firm we said, “Let’s stop working with sheet materials and start getting into volume.” The majority of architecture throughout history has been carved in stone — a volumetric material. So let’s get back into figuring out how to work with that. What’s been really exciting is to see other architects get inspired by that motivation and starting to look at what’s possible with volume. So we’re seeing projects emerge right now with extensive use of volume that we can’t take all of the credit for but we would like to think we could take some. None of that is a driving motivator for us. We don’t go into it saying, “we want to transform the way architects think about volume.” We wanted to do that stuff ourselves because we’re really interested in defining different types of spaces and experiences for people. That’s our motivation. We love research. Primarily because it challenges us every time we work on a project. Nothing gets stale for us, nothing gets old. If you see something that looks familiar in our work it’s because we’re trying to solve a problem. We might do a project again and do it better. In that respect we love research for those reasons. It’s been working for us so far. I wouldn’t discount doing client work though, because there are plenty of other challenges that emerge on that end. I enjoy the kind of work that we’re doing. Research will remain in our practice no matter what. Most of my influences are very old. One of the biggest influencers would be Philibert de l’Orme. He was a great architect in the 1500s translated what stone masons already knew as a way to create projective drawings that make templates to wrap around a stone so a mason can carve extremely precise three-dimensional shapes that align with others once assembled. As a result, you get these incredible pieces of stone architecture that are unbelievably more advanced than anything we’re doing today. That is one of the points of inspiration for the volumetric work we do. I’m also fascinated by Incan architecture and the Rapa Nui (Easter Island) Moai. I love old stone architecture. Mainly because no one has been doing work like that recently. The McKnelly Megalith was directly inspired by Inca stonework and the Moai. It was a research project investigating that. There is a man named Carl Lipo who recently discovered that the Moai walked into place. The Rapa Nui carved the Moai to have a center of gravity that leans them forward so all you do to move them is rock them back and forth. What’s incredible is that this so-called “primitive” civilization did amazing things like that, which is computation. They figured out how to work with a dynamic system moving extremely heavy objects that engages physics and complex carving geometries. That’s exactly what we’re talking about when we discuss bringing all of these complex systems together to complete a task. 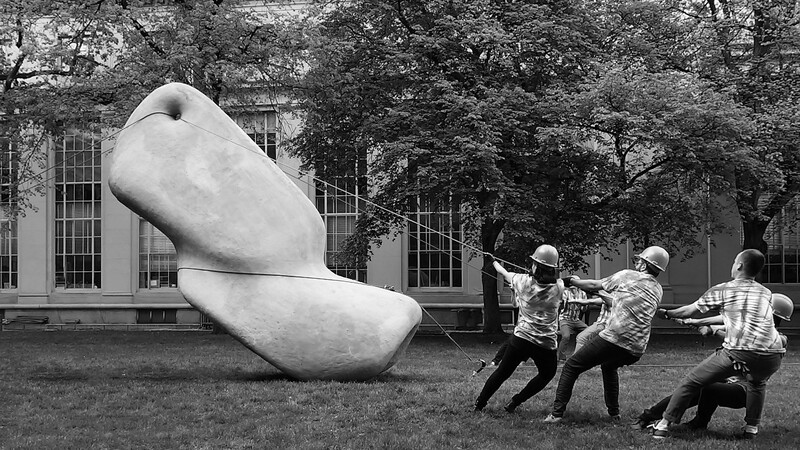 The Megalith was an MIT studio project inspired by this where we said, “let’s figure out how to make something walk horizontally and then stand once it gets into position.” Those were the two goals we had, those two actions. The Megalith is what emerged because of it. That project is one that I’m most proud of. The biggest disruptive opportunity that we have right now is offering architects the ability to communicate with their collaborators in a much more intelligent way. Instead of handing off information and relinquishing control. I don’t want to stipulate this in a way that architects need to control everything but the better we have the ability to engage the processes the more intelligent the architecture can emerge. This would be opposed to everyone wanting ownership or authorship whether it be the structural engineer or the environmental engineer or the landscape architect. There are so many people that need to be engaged to produce any architectural project. Through computation we’re capable of more intelligently tying these together. I would have offered myself more patience in the early work. The moment I’m referring to was when I was working at Office dA and straight out of undergraduate and Nader Tehrani said take this project on. I’m starting to deal with clients and I would have given myself more patience with clients. They deserved it and the project deserved it. I’m starting to find more patience when it comes to those areas. It wasn’t so much about frustration as it was passion. I would offer more patience to the passion.